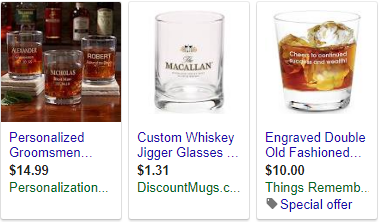 PRO TIP: Adding GTINs to your products makes them eligible for shopping comparison on Google. Be sure to add the GTIN to reach more customers! PRO TIP: Add the promo code for any upcoming promotions to the promo_ID column to run merchant promotions! Take a look at the two titles below. Which one do you think customers are more likely to be interested in? While custom labels are not required, adding labels to different products can make building and segmenting your campaigns much more effective. Custom labels allow advertisers to segment their product groups by specific attributes outside of the category and product types. For example, many retailers choose to add price tiers to their products: $39,99 and below, $40.00 to $99.99, and so on. An advertiser can then segment their product groups based on price and adjust their bids and budgets to products with a higher average order value. This also helps when it comes to adding negative keywords for shopping campaigns. You can add custom labels and segment by almost any product attribute. Some other ways advertisers may prefer to segment are by “Top Sellers/Bottom Sellers,” “Spring/Summer Collections,” and much more! If you have thousands of products or are looking to outsource your feed management, partnering with a third-party feed management vendor may be an ideal solution. These platforms give you the option to send your product feed to a vendor, who will then optimize and manage the feed. This can save you tons of time to focus on building and optimizing your shopping campaigns. DataFeedWatch is a third-party vendor that helps advertisers prepare their product feeds for Google, Amazon, Facebook, and other platforms. Their platform downloads product feeds everyday to manage inventory and allows advertisers to optimize their feeds without technical knowledge through pre-populated templates, or they can setup advanced optimizations to supercharge your feed. Their platform provides analytics to help advertisers determine which channels and products are the most efficient, along with customer support and training videos. Feedonomics is another third-party vendor that also helps advertisers with their product feeds. Feedonomics’ platform helps advertisers optimize for Google, Amazon, Facebook, and other platforms well. One of the differences between Feedonomics and DataFeedWatch is that Feedonomics focuses on feed optimization and does not help to manage inventory. Feedonomics does offer amazing 24/7 customer support through their FeedFillment team, and will even provide a free product feed audit for prospective advertisers. Having a robust and optimized product feed can make all the difference between barely hitting your goals and crushing them. If you’re looking for ways to get more out of your shopping campaigns, start with your product feed. Most retailers see a huge spike in traffic & sales during Q4 and the holiday season.. Testing out different titles, custom labels, and other tactics now can set you up for a smooth and successful Q4. Happy retailing!